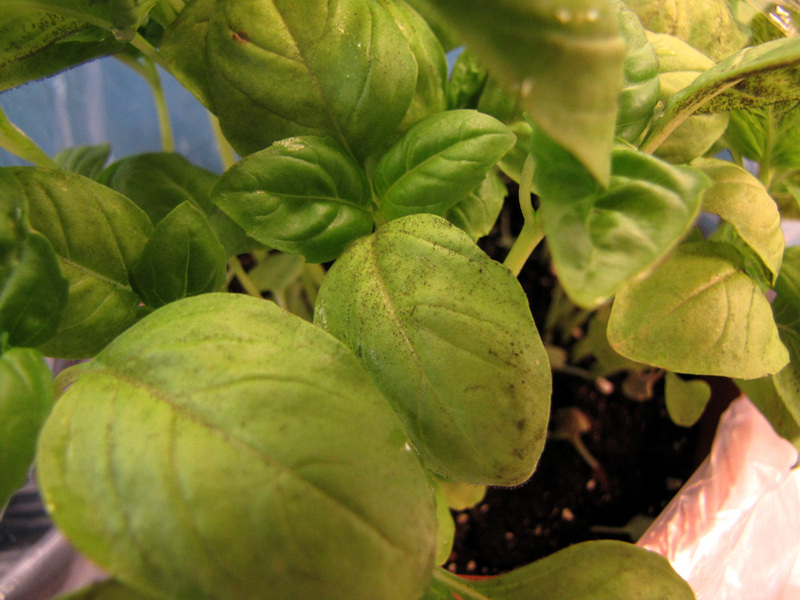 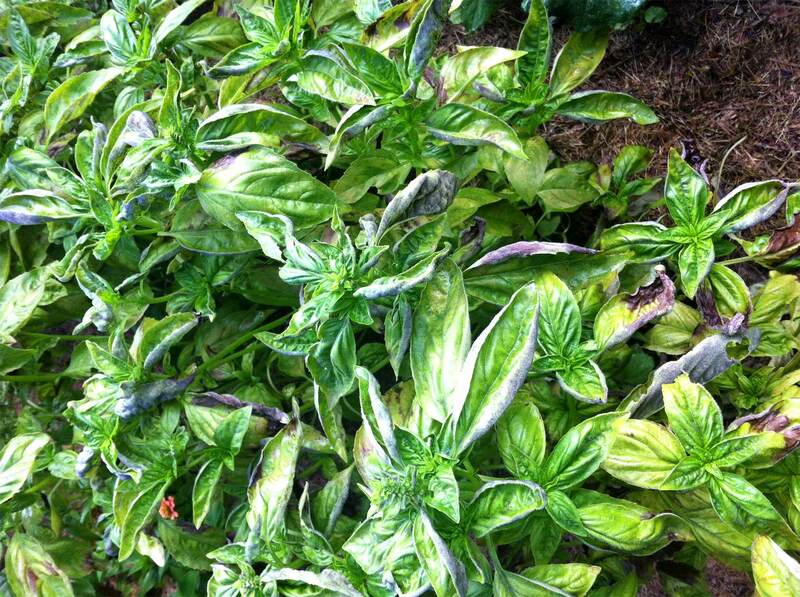 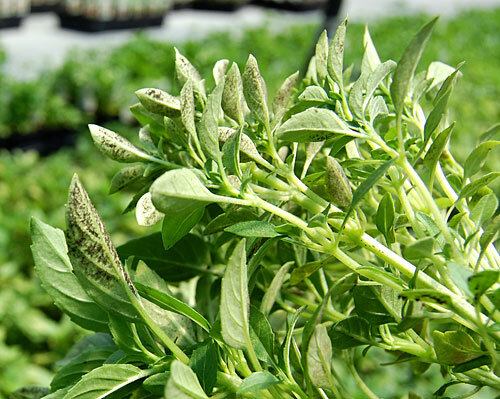 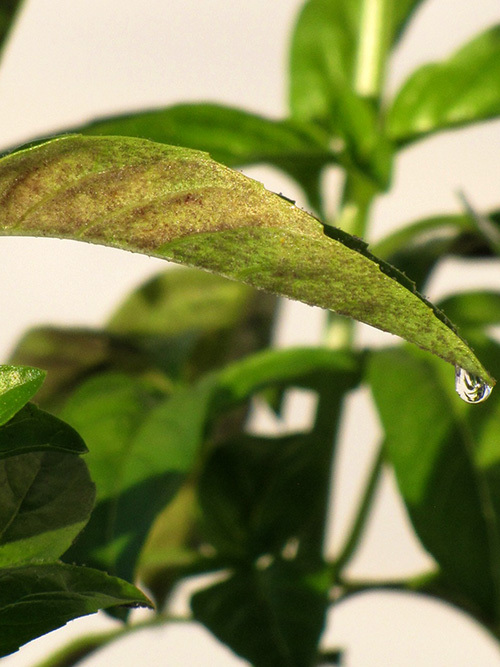 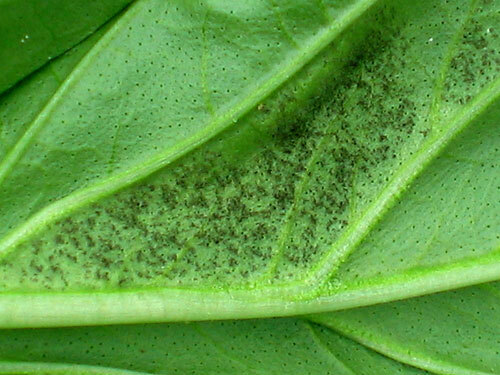 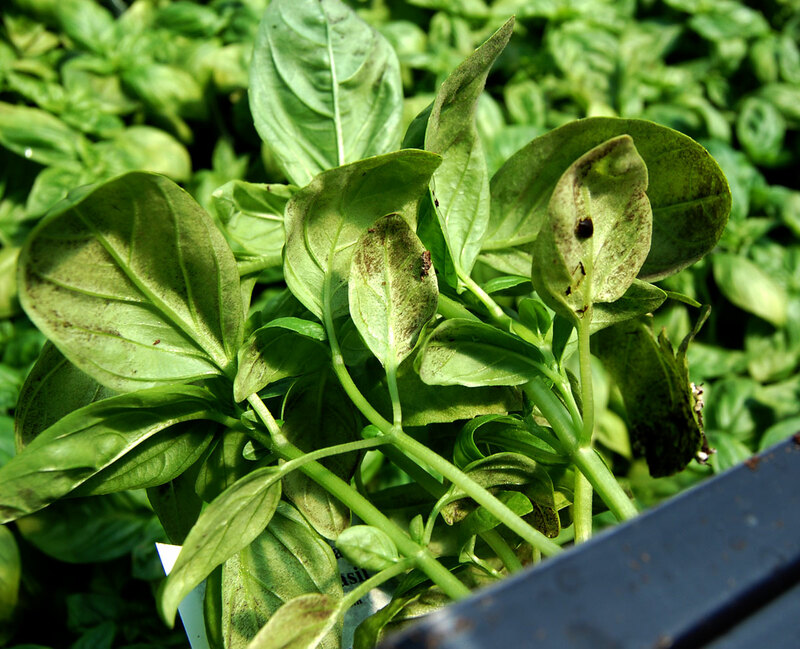 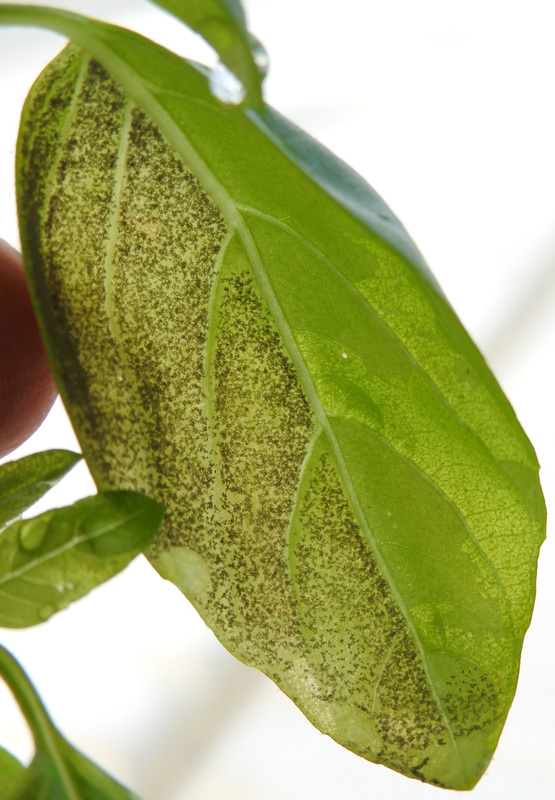 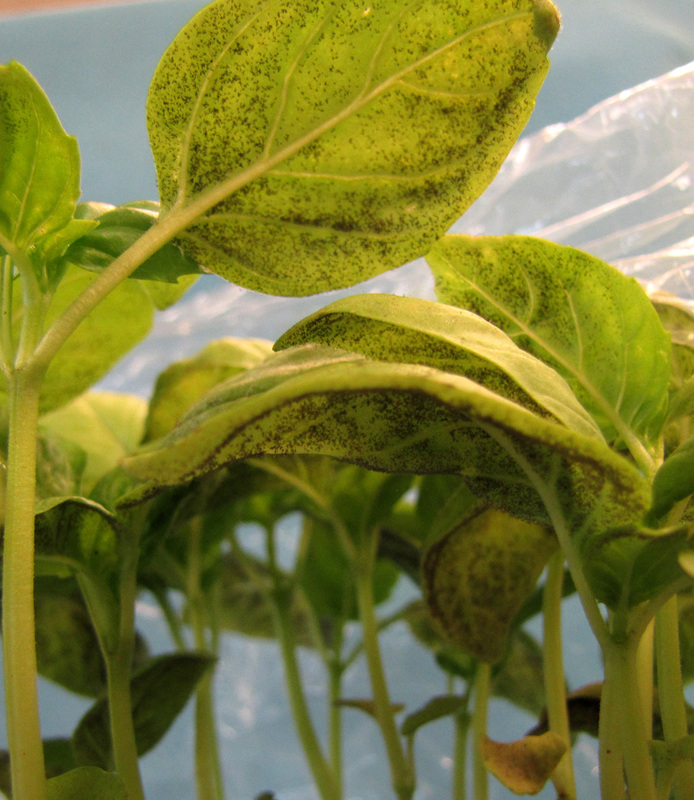 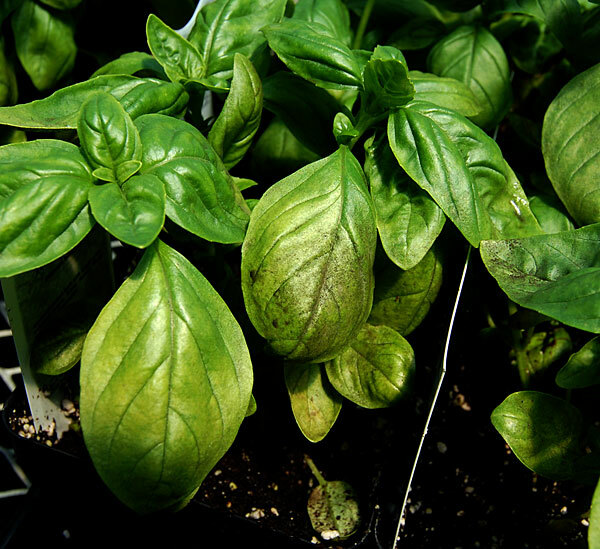 Find more information about basil downy mildew and its management on the Basil Downy Mildew Extension page. 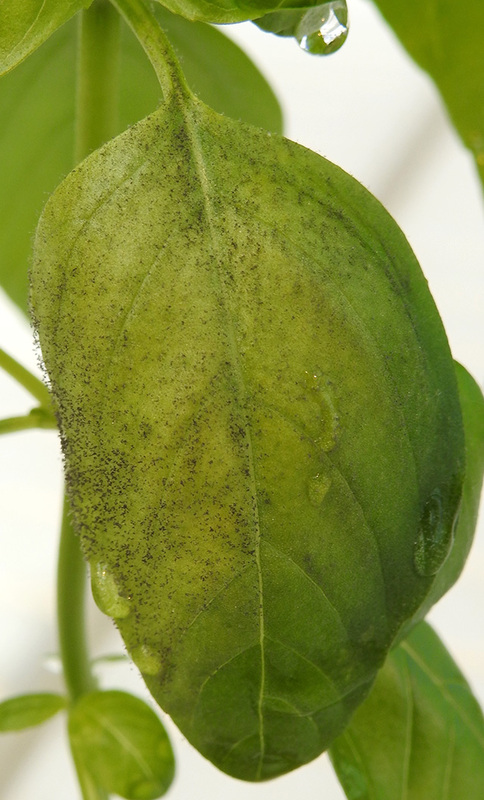 Following eight images show first symptoms of downy mildew found on untreated plants in a home garden. 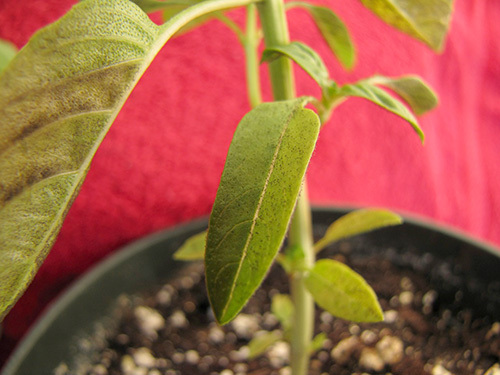 First three photographs taken on 9 August 2009, next five taken on 12 August 2009. 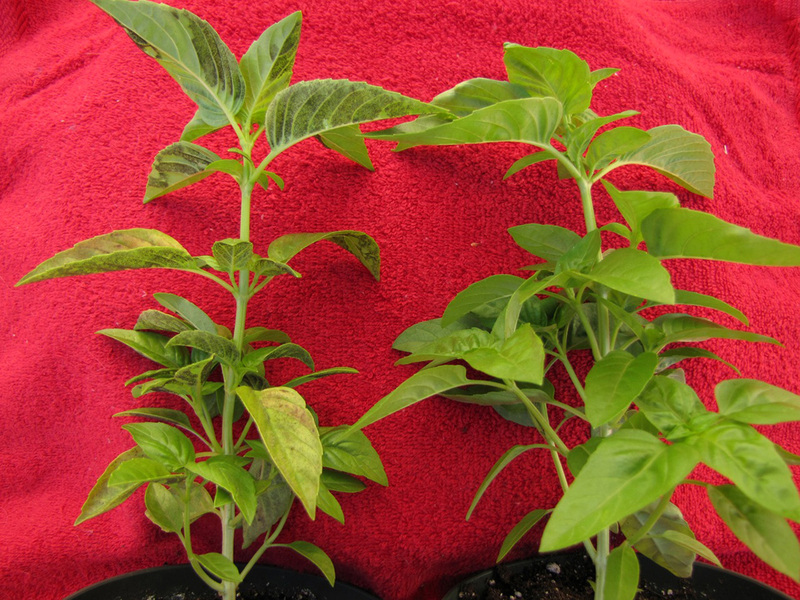 Yellowing on upper leaf surfaces. 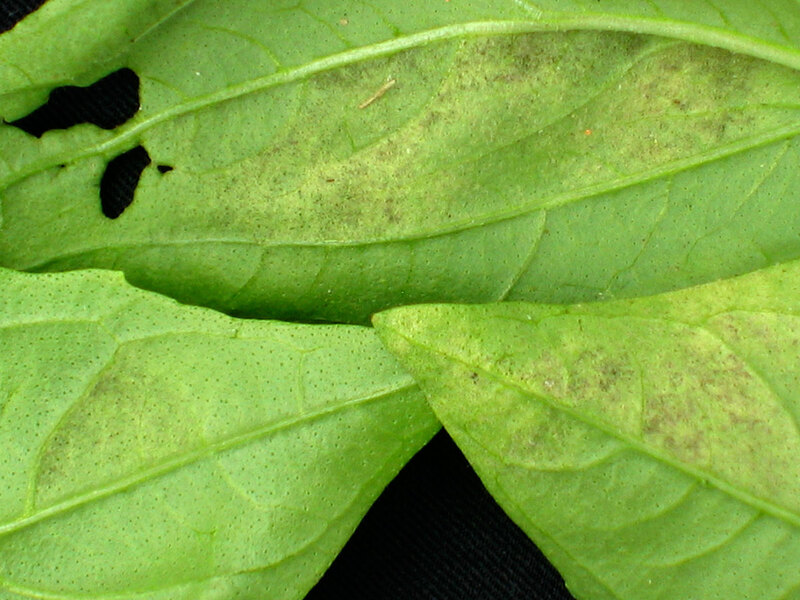 Pathogen growth and spores on lower leaf surfaces. Next two images: Sporulation of the basil downy mildew pathogen abundant on the lower leaf surface and also present on the upper surface of leaves of infected commercial basil plants kept in high humidity (inside a plastic bag) over night. Below: Sporulation on container grown plant kept outside (left) but not on plant brought inside at night (right). More information. 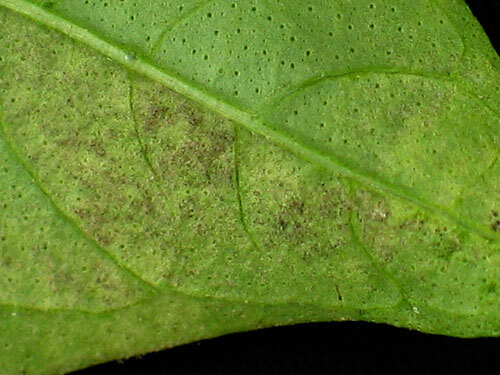 Below: Sporulation on both surfaces of small leaf. Below: Sporulation on upper surface of large leaf. 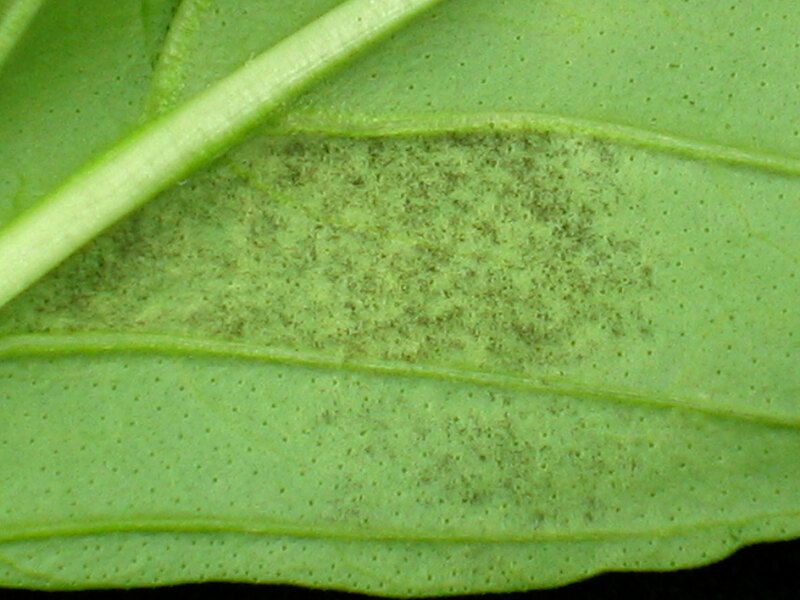 Below: Sporulation on wet leaf with dew drop. 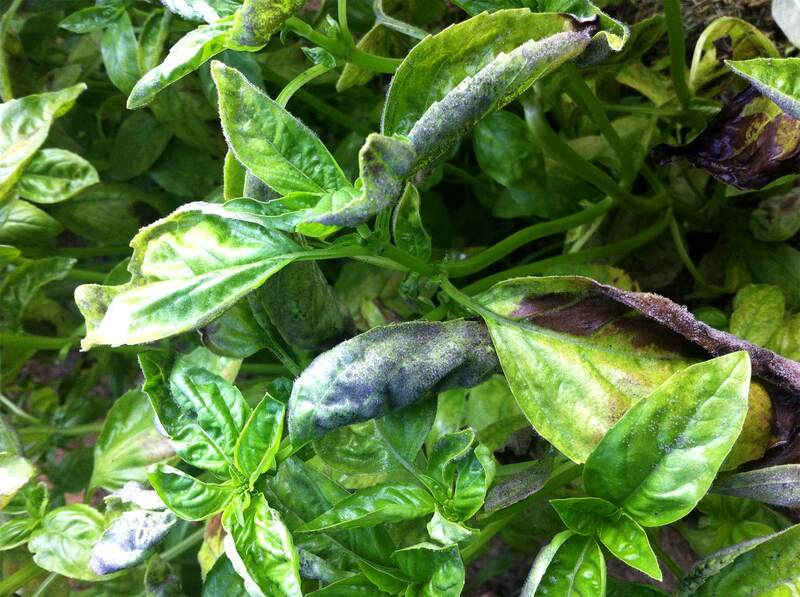 Under humid conditions the pathogen produces an abundance of dark spores as shown in photographs below from Fran Smith in Pennsylvania who submitted them for confirmation of her report to the monitoring program. When humidity is low the pathogen does not produce spores. 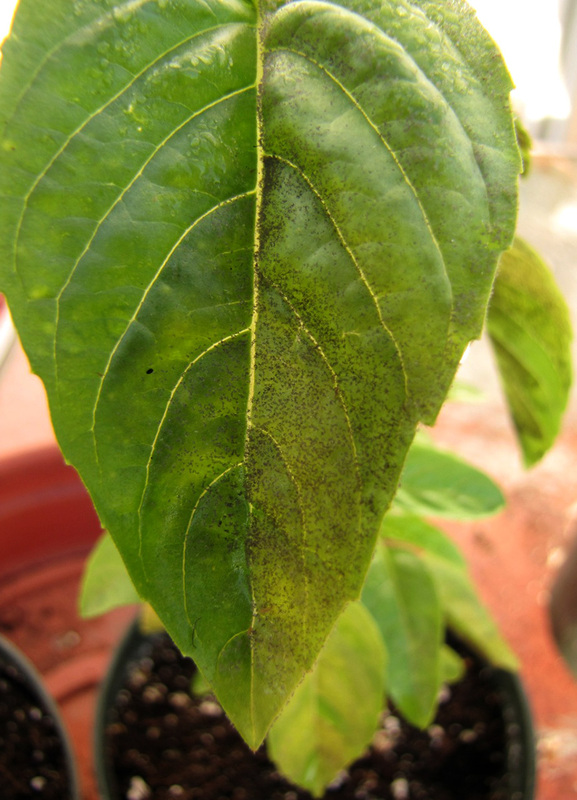 Leaves below were on a gardener’s potted plants that were being brought inside at night to minimize time the plants were exposed to conditions favorable for disease development. Yellowing on these leaves, especially where in bands delineated by veins, looks like symptoms of downy mildew. 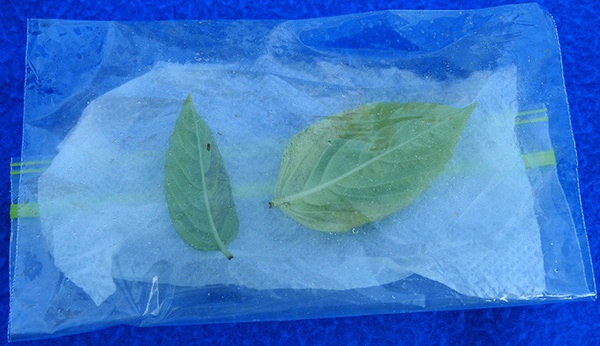 To determine if it was this disease, the leaves were put upside down on wet paper towel in a sealed plastic bag over night. Under high humidity in the bag, the pathogen produced spores confirming the symptoms were those of downy mildew. Infection was able to occur because these plants were left outdoors sometimes when humidity was high. 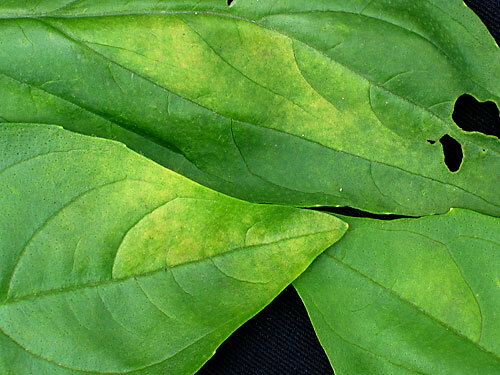 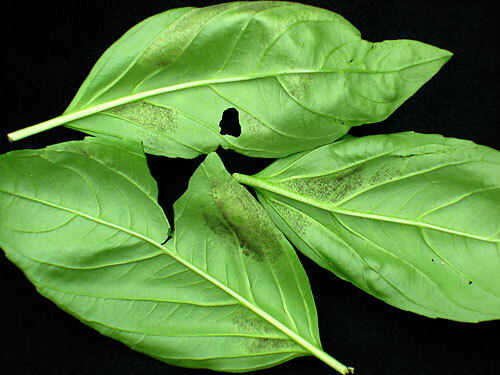 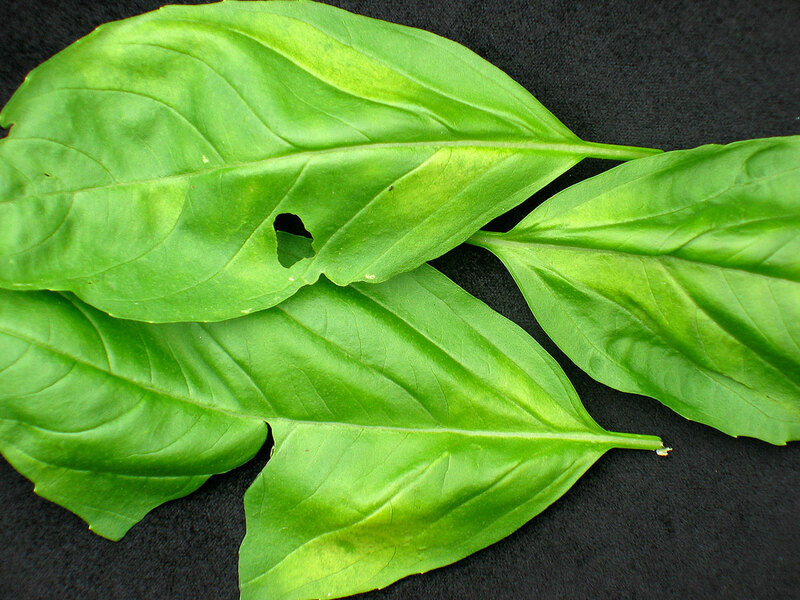 Only these two leaves were found with symptoms while pathogen sporulation was observed on many leaves on plants that stayed outside at the same time. 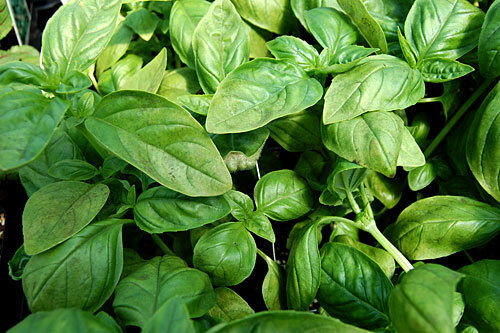 A sunny, open location seems like a good spot for growing basil to minimize humid conditions favorable for downy mildew. 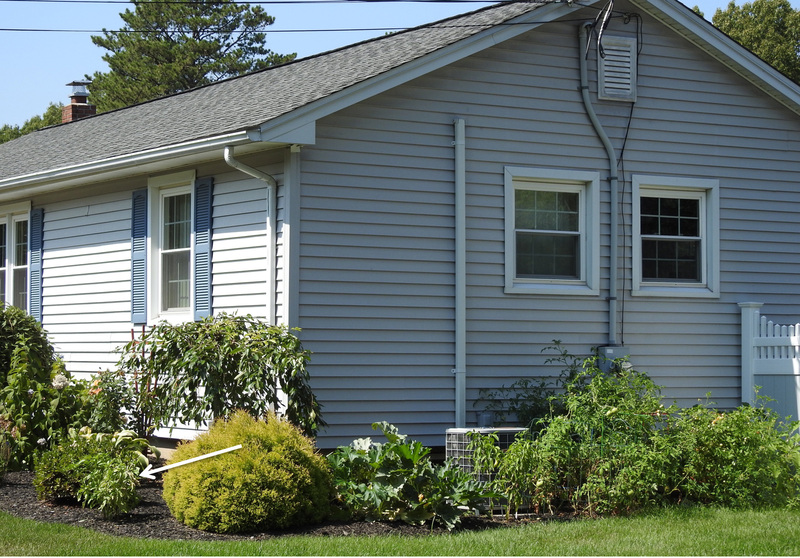 But the basil plant in the landscape planting in the picture below still experienced enough high humidity during rain and overnight for downy mildew to develop. 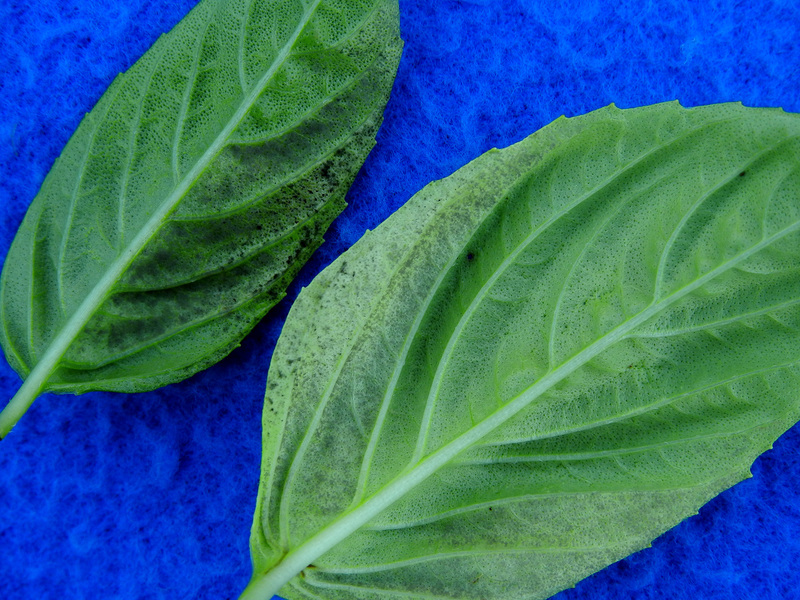 Downy mildew developing on single plants like this one documents the abundance of spores of the pathogen in the air. 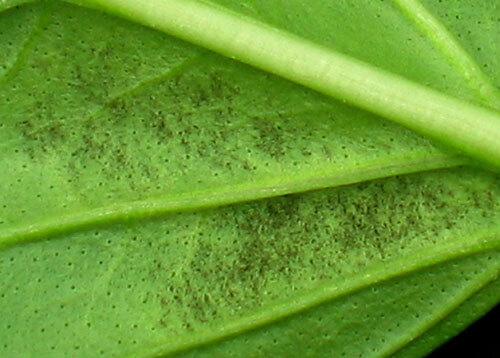 These spores are deposited by chance. 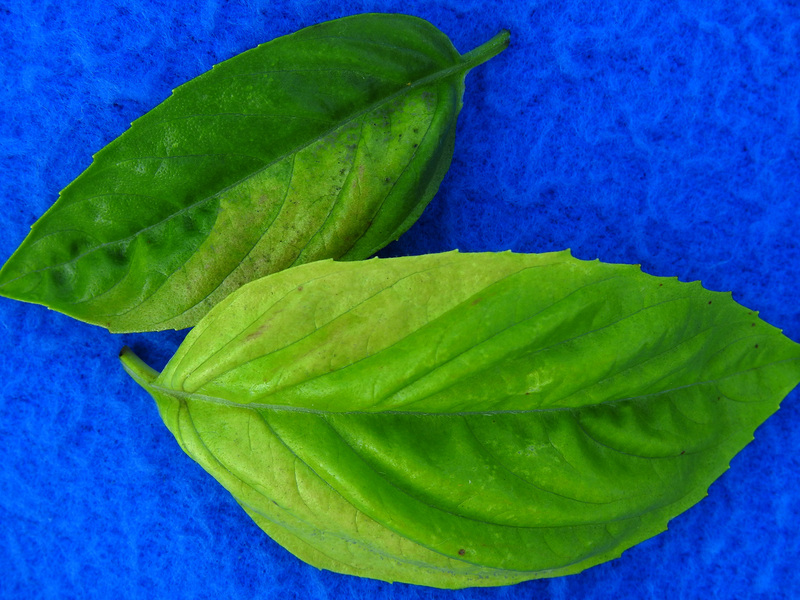 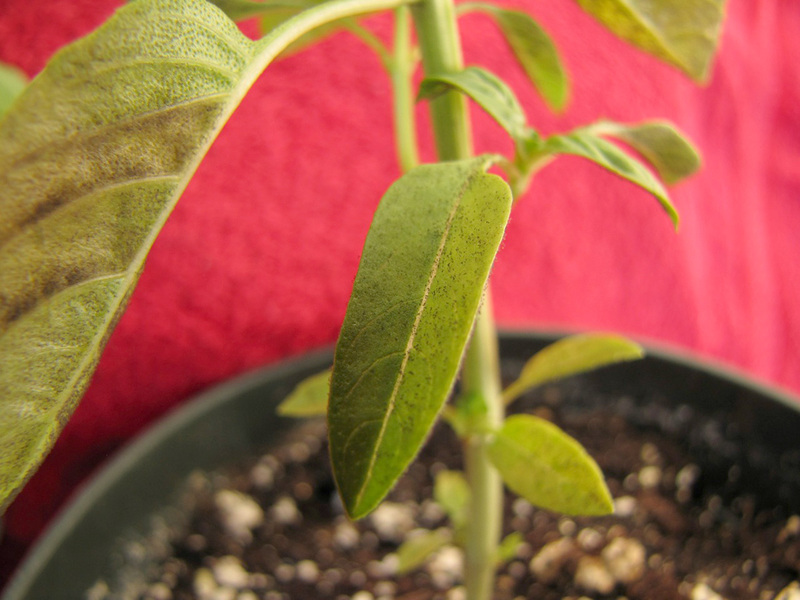 Below, thick, fresh sporulation on left side and initial symptom of water-soaked tissue on right side of leaf on plant that was enclosed overnight in a plastic bag. Lot of spores on upper leaf surface and on petiole.